This is the mother malolactic bacteria culture we are using to inoculate our dry reds. 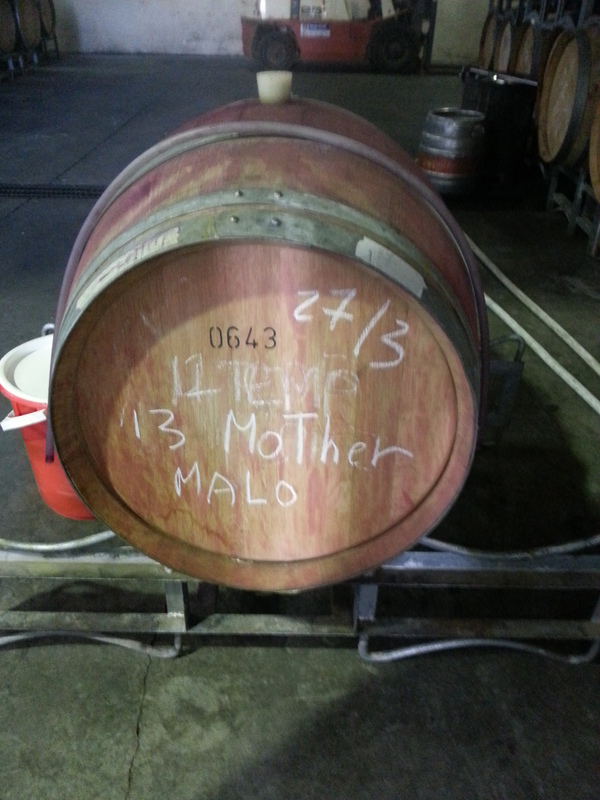 Malo season is the swan song of harvest. It means what was fruit is now alcohol. This process and the particular personality of each of its individual manifestations continues to excite me, even if I lose touch with my own interest after the eight millionth pumpover. Fruit comes into the winery in different conditions – differing levels of sugar and acid, different degrees of tannin, juice, flavor, and temperature. Because of these variations, all batches process at their own speed and with a variation of acid adjustments. 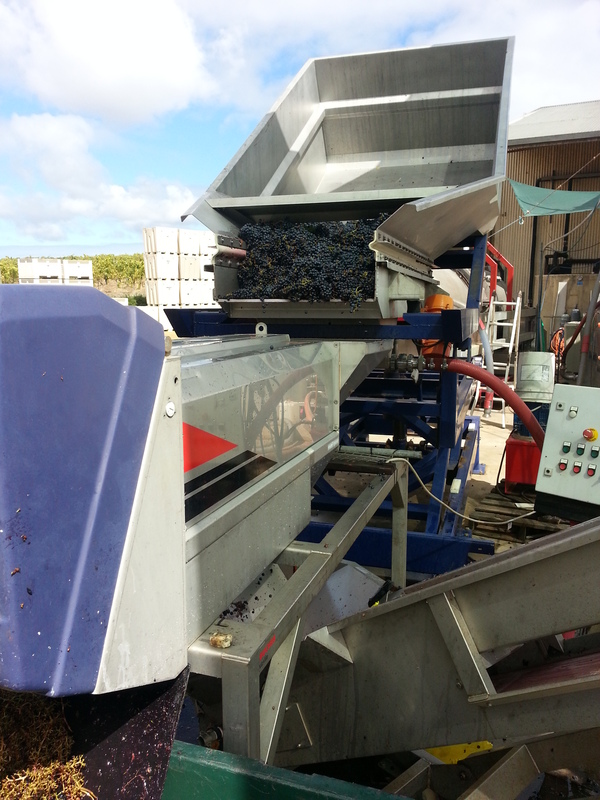 Machine picked fruit has been sorted in the vineyard and can mostly fly through, unless it goes over the sorting table, which slows us down to nearly 1 ton per hour. Handpick fruit goes at a different pace depending on the variety – big “slip-skin” clusters like tempranillo and semillion clump up and annoy us. I’ve decided cabernet franc is the easiest to process, from a purely mechanical point of view. Once the fruit is in the tank, it gets a homogenizing pumpover and we run analysis to determine whether it needs any adjustment. Last, we give it a partial inoculation. 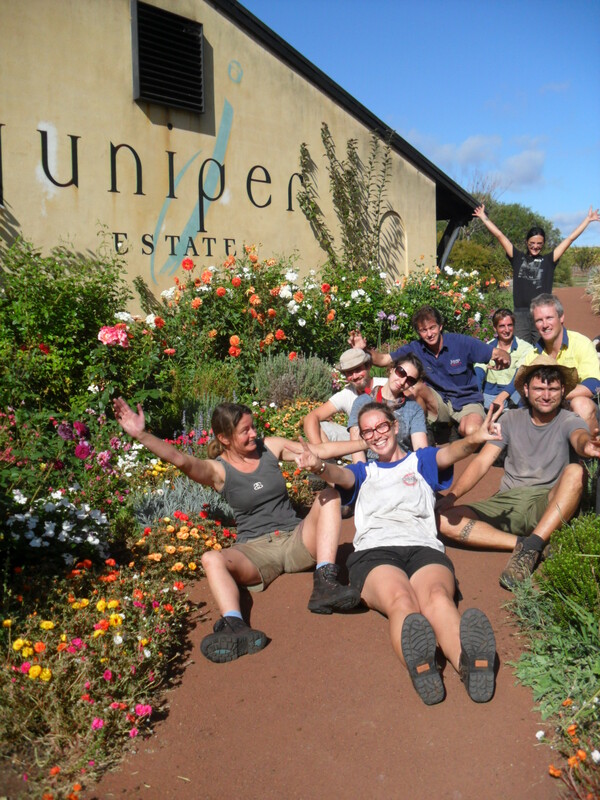 We chill the reds right down to about 9 degrees celcius – too cold to ferment. Yeast would die at that temperature. So we just sprinkle it over the top instead of mixing it in. A slight cap forms and produces enough C02 cover to ward off bacteria and oxidation while the fruit comes up to fermentation temperature over a period of a few days. When it’s warmed up enough, we give it a second dose of yeast and the ferment takes off, ready to be punched down and pumped over and racked and returned over however many days until it’s dry enough to press. At Juniper, there are just enough people for everyone to be fully in command of whatever they’re doing, but not so overwhelmed that there isn’t time to consult, to ask for a hand, to pal around in between jobs. One person can run the entire crush pad. One person can manage the ferments. One person can run pressing. Often enough, one must do several of these things at once, which is good practice. These are our jobs now. Or, these were our jobs. Friday we saw our last fruit – our cabernet sauvignon from our best block and oldest vines, which I can see out my kitchen window. I watched the tractor as I stood at the coffee maker, the sun already on the vines by 6 am. We cracked a Margaret River sparkling to toast the last hopper-load and then hosed it all down, filled the must-pump lines up with caustic and firehosed the entire crush pad to wipe the slate clean and start taking it apart, bolt by bolt. Who knew you could come to feel kinship with pieces of machinery. It’s down to the wire now for me. That moment when the immediate future is fully up in the air and there are decisions to be made RIGHT NOW and I have no idea what is about to happen. Suspense is alright in the movies but I’m not crazy about it personally. But regardless of what I decide, I’m still here in Margaret River for some time. It’s not summer anymore but some days it still feels like it and the veggie garden is coming in fat and happy enough to feed us. The vintage that never really took off is coming in for a landing and I can be found staring into the sunset in endless, self-indulgent deliberation until someone pokes me with a fresh-caught crayfish and tells me it’s time to eat.